For a bargain room in a great Downtown neighborhood, it’s hard to beat this cost-conscious favorite. 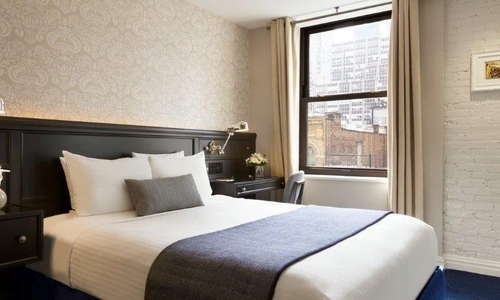 The hotel is on a busy TriBeCa intersection and is an ideal launching pad for exploring nearby neighborhoods including SoHo, Little Italy, and Chinatown. The building dates to 1838—even Abraham Lincoln slept here. A 2014 refresh transformed simple rooms into sleek spaces with a gray and light blue color palette, central air, and New York-inspired design details. 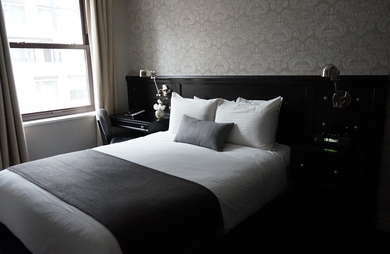 Windows overlook pretty Tribeca streets and rooms have original details including whitewashed exposed brick walls. The junior suites are a worthwhile splurge, offering lots of space, huge windows that let in ample sunlight, and a big tufted couch. 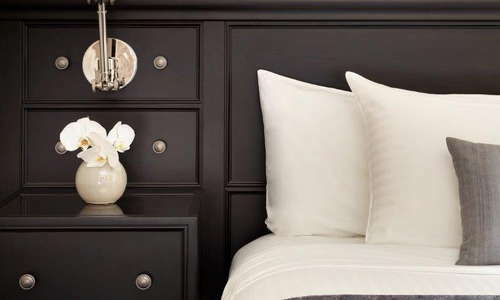 YOU SHOULD KNOW The smallest rooms are very tight on space—look closely at room types when making a reservation. 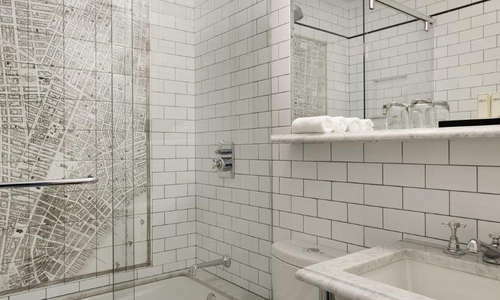 Modern bathrooms have artistic maps of New York City on white subway tiles, Frette towels, and bath products from C.O. Bigelow Apothecary. The small lobby has a historic feel with a carved wood desk and walls, plus fun accents like a rotary phone. Tufted couches and a couple armchairs provide places to sit, but this intimate space doesn’t have lots of extra room for lounging. There are a couple public computers for guest use. Who doesn't love public computers? There is no full-service restaurant on-site, but the neighborhood is full of excellent restaurants at a range of price points and there’s a Whole Foods supermarket nearby. So, unfortunately, the dining at this hotel is: walk outside and find a restaurant. Located on West Broadway and Chambers Street, this property shares a corner with a major subway stop for the 1, 2, and 3 trains (Chambers Street). From this location, it is possible to wander and explore several downtown neighborhoods on foot, including SoHo, Chinatown, and Little Italy. Taxis and Uber are widely available in the neighborhood. Join New Yorkers for a classic breakfast of bagels and coffee at Zucker’s Bagels (1-minute walk), a casual shop with excellent smoked fish. 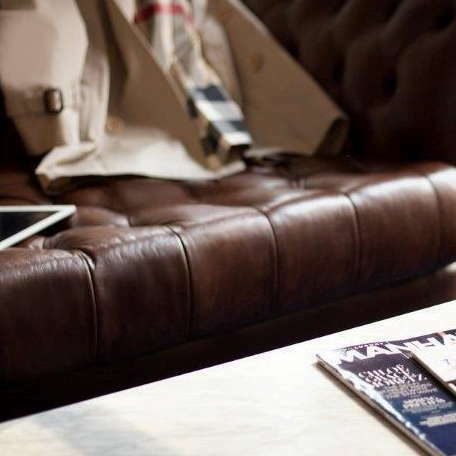 Make a reservation at Marc Forgione (2-minute walk) to splurge on a night on the town. This candlelit restaurant serves creative preparations of familiar ingredients—save room for dessert. Set in a historic townhouse dating back to 1810, Tiny’s (3-minute walk) is a charming neighborhood restaurant—aim for a table in the back by the fireplace. For a creative cocktail in a retro-inspired bar, check out The Bennett (3-minute walk). One of the city’s best wine bars, Terroir Tribeca (6-minute walk), is located a short stroll away from this hotel—check out the wide variety of wines available in a 3-ounce tasting portion. A dynamite location and historic charm set this property apart from other downtown hotels. We love the fresh rooms, New York-inspired design details, and the value for money in an expensive neighborhood.